There was a BIG BANG on July 21, 2016 in Prishtina, and we’re not talking about the theory of how everything was created in the universe. DOKU:TECH Special Edition with Laura Mersini-Houghton gathered more than 400 attendees from different backgrounds who came to interact, be inspired, and illuminate. The brand new design, program and keynote speakers of the third edition of DOKU:TECH 2016 were unveiled last night by Kushtrim Xhakli – the curator of the conference. Furthermore, the registration for the event on August 6-7, 2016, in Prizren was officially opened and it will stay so for the following weeks. DOKU:TECH Special Edition highlight was the presence of the renowned scientist, Prof. Laura Mersini-Houghton, who was surprised and enchanted by the warm welcome and roaring-long applause of the audience. 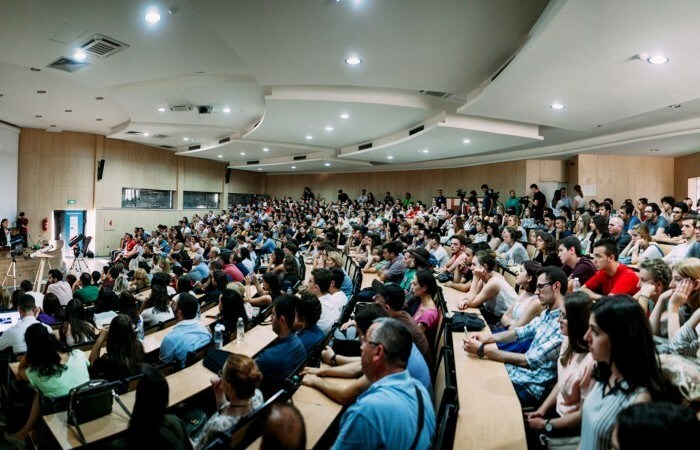 Physicists, professors, students, curious minds, and science enthusiasts filled the venue to welcome the cosmologist who has challenged the world’s knowledge about the universe. Laura Mersini-Houghton is an Albanian/American Scientist and Theoretical Physicist, whose recent work has raised a lot of questions and involves mathematical proof that there might be alternate universes (known as The Theory of Multiverse)! With her latest findings, Laura not only questions existing theories of world famous scientists, but challenges the audience by opening doors to entirely new ways of observing our universe. “We see more than ever! We understand less than ever! Is there beauty and order in the universe?” said Laura Mersini-Houghton during DOKU:TECH Special Edition. The vigorous and eager audience had the chance to discuss further and interact with Prof. Mersini-Houghton during the Q&A session. The latter gave participants the chance to learn more about her professional experience, such as the existence of concrete proof that the multiverse is real, or even the way that universes in the multiverse would communicate with each other based on string theory. “Is there actual proof that the multiverse could be real? Do you really believe that black holes cannot exist?”, were only some of the inquiries which were answered with pleasure and a smile on Mersini-Houghton’s face. A standing ovation in the end was the minimum that audience could do to express the appreciation and respect for Laura’s contribution to science.